With spring just around the corner, it’s time to get a head start on your spring cleaning. While the kitchen is an obvious location to deep clean during the spring, the fridge is sometimes forgotten and is a major dirt/waste collector. 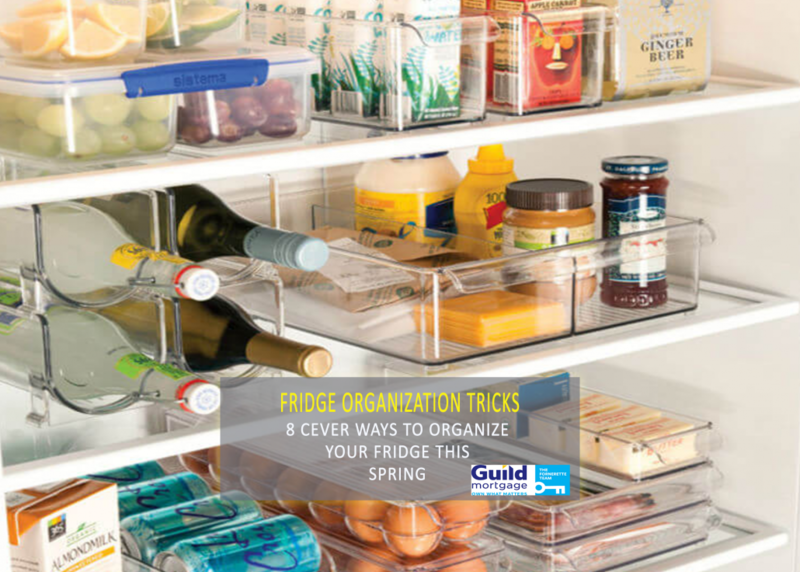 See these 8 clever (and fun) ways to organize your fridge this spring. Step 1 is to take out everything in your fridge and place on your counter. This allows you to clear off the shelves in your fridge as well as dispose of any expired food you have in your fridge. Even if something is not expired, this gives you the opportunity to get rid of anything you’re simply not using and it’s taking up valuable space. The next step to organize your fridge is to deep clean. Whether you use multi-purpose Lysol spray, or make your own natural fridge cleaner, the next step is to wipe down all surfaces of the fridge. Remove any additional shelves so you can clean in the cracks as well. Once you’ve wiped down all surfaces, let the fridge dry for about 10 minutes. Just like contact paper, fridge liners are designed to protect your fridge of spills and messes. If a soda spills in your fridge and you have the residue sit in your fridge for months, it’ll be that much harder to clean up later, not to mention add a not so pleasant odor. By using fridge liners, you can tear out the liners and insert new at any time. Labeling the inside of the doors will help you find your food much quicker and organize your fridge. It will also indicate if you have two of the same thing so you can combine the bottles and make more room in your fridge. Office labels found on file folders work well as they are easy to remove and easy to write on. If you need to change your label, it’s easy enough to replace and write the new category. Clear organizational bins are not only for your desk and drawers. These bins can be used to separate and organize the food in your fridge! 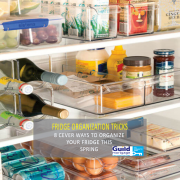 Using multiple sized clear bins will make it easy to grab foods on the go and well as stack bins without damaging the foods. The best part is about these bins is that they are easy to clean and prevent you from having the clean the entire fridge shelf. One of the reasons why food expires in the fridge is because some of it is hard to reach and is buried in the back. Install a small lazy Susan on the top level of your fridge so you can easily locate the food on the lazy Susan. Say goodbye to buying three jars of jam because you can’t find the other ones! Plastic containers can take up a lot of unnecessary room in your fridge. Using mason jars instead of plastic containers can food fresh, and can store small foods such as kiwis and grapes with the lids off. If you pre-cut fruits and veggies, keeping them in mason jars can be a solution to keep them fresher for longer. Take 10 minutes each month to go through your fridge and see what you can dispose of. Week old leftovers? Moldy bread? Flat soda? By getting rid of these items on the regular, you are clearing space in your fridge and can fill that space with new items.